"Salmon is a delicate fish that does well when lightly smoked and gently seasoned. Cooking it on a plank over a live fire gives it a great smoky flavor while letting it hold its shape." Preheat the smoker to 250 degrees F (120 degrees C) according to manufacturer's instructions. Combine butter, garlic, 3 sprigs dill, and salt in a heat-proof dish. Place in the smoker until butter is melted and infused with flavor, at least 20 minutes. Remove from the smoker. Lay salmon on the plank of wood. Brush salmon with the flavored butter. Season with salt and pepper. Place in the smoker and close the door. 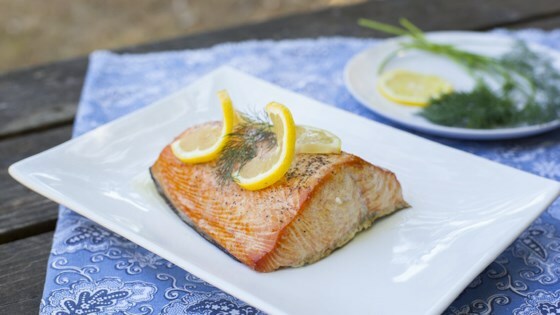 Cook salmon until easily flaked with a fork, about 40 minutes. Check at 10-minute intervals and baste with butter. Serve garnished with lemon slices, remaining dill, and remaining flavored butter. See how to make cedar planked salmon with a simple Asian marinade. Bake salmon in the oven instead of a smoker if preferred.